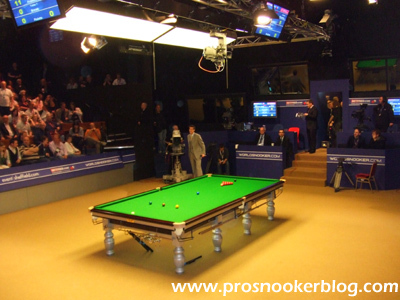 Following what had been a stellar year in 2007, the 2008 World Championship was to be another memorable event with both Ronnie O’Sullivan and Ali Carter making maximum breaks on their way to the final. Again, the tournament was to be sponsored by 888.com for what would prove to be the third and final time, although we did not know that at the time and the Cue Zone was to return in the form of the marquee in Tudor Square, that year housing the BBC’s TV studio. The tournament was one that caught fire from the opening round, with 2007 runner-up Mark Selby, who having just won the Masters on his début and defeated O’Sullivan in the final of the Welsh Open, was one of the favourites to take the title, suffering a shock 10-8 defeat at the hands of Mark King. Another to make an early exit was 2006 world champion Graeme Dott, whose participation in the event had been in doubt right up until the days leading up to his match against an inspired Joe Perry, while former world champion Ken Doherty was to suffer a shock defeat to Liang Wenbo, relegating him from the top 16 after the tournament. Of course it would prove to be the tournament where Liang would go on to make a name for himself, defeating Joe Swail 13-12 in a dramatic last 16 match, before losing to O’Sullivan in the quarter-finals. Also making an impact was Jamie Cope, who impressed before losing out in a deciding frame to Peter Ebdon, while there was a controversial match between Ali Carter and Barry Hawkins, in which Hawkins won three frames in a row to force a deciding frame, only for the players to be pulled off at 9-9 at the end of the afternoon session. 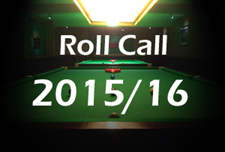 On their resumption it was of course Carter who recovered to take the match and would go on to make the final. 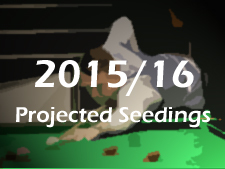 For me though, without doubt the most memorable match of that year and one of my most memorable at the Crucible full-stop was that between Stephen Hendry and Mark Allen on table one. At the time, Hendry had been struggling for results generally and Allen was for me the most dangerous qualifier in the draw, after his hugely impressive Crucible début win against Ken Doherty a year earlier. He had already beaten Hendry earlier in the season at the UK Championship and for me came into the match as a slight favourite at the time. Having opened up a 6-3 lead after the first session, I recall sensing that we could be in for something special at the start of the second as unusually for him, Hendry was able to win the first frame having needed two snookers. From what I remember, Allen then moved 9-7 ahead and was perhaps unfortunate not to get over the line, before Hendry capitalised on an in-off from the Northern Irishman in the decider to claim the match in one visit, clenching his fist at the TV camera as he left the arena having pulled off what would prove to be an important win for him. For Hendry, he would go on to defeat Ding Junhui and Ryan day to reach the one-table set-up for what would be the final time in his career, before running into an unstoppable Ronnie O’Sullivan in the semi-finals. In the bottom half of the draw meanwhile, Stephen Maguire was a player who was gathering real momentum and for a while, actually replaced O’Sullivan as the bookies favourite for the title, following his 8-0 session whitewash against Neil Robertson in the second round. Surprisingly at the time however, not least to Maguire I suspect, he was to lose 13-12 to Joe Perry in the quarter-finals, Joe having continued his form from his opening round win against Dott and also from Crondon Park, having won the inaugural Championship League event a few weeks earlier. For Joe though, he would himself lose to another player who had done well at Crondon Park in Ali Carter, who was riding the momentum of his 147 break against Peter Ebdon at the quarter-final stages. It would be O’Sullivan who would have the final word however, taking his third world title with a dominant 18-8 victory, despite the intervention of a streaker at the start of the final session! Moving on to 2009 and in many ways this marked the start of a transition into a new era, both for the tournament and for me personally. 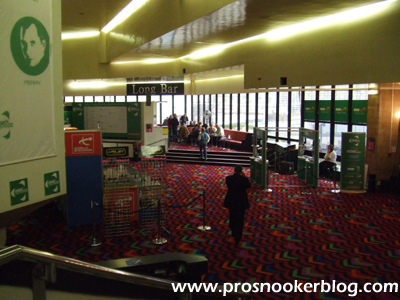 As far as the event was concerned, this was to be the first year that the event was to be sponsored by Betfred, a last minute decision as evidenced by the fact that they didn’t even have time to get a new carpet in from the year before. 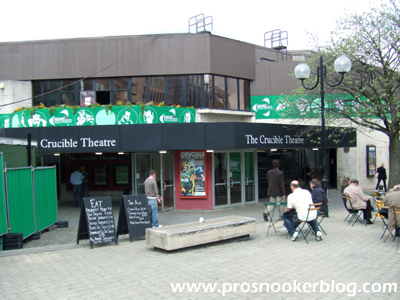 It was also to be the first year in which signs of the refurbishment work to the Crucible that had been ongoing for a couple of years became evident, not least with the all new main entrance to the building, the new ticket office and the new carpet upstairs. On a personal note it was also my first year of attending as a blogger so to speak, while it was the first that I had also been able to go to the qualifiers and so I had something of a different perspective on the event and certainly more of an understanding as to what the unseeded players had gone through just to make it to the Crucible. 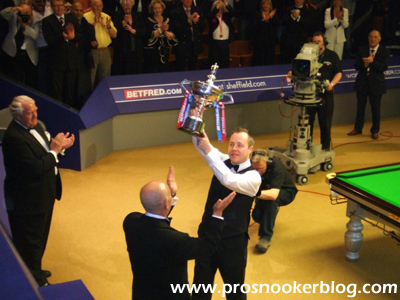 One thing that had not changed however is that John Higgins was still a class act and the year was to mark his third triumph at the venue, as he ran out a comfortable winner against 2005 champion Shaun Murphy. In terms of the opening round, once again there was to be a dramatic opening round match involving Stephen Hendry, the seven-times champion being drawn against two-time winner and friend Mark Williams. Although it was Hendry who started the better of the two, Williams was able to win the last four frames of the opening session to take a 5-4 lead and looked to be on his way to victory as he extended his lead to 7-5. Unfortunately for the Welshman however, he was then to suffer problems with his tip, which from memory necessitated a change and from the moment that Hendry produced a clearance of 51 to take the next frame, it was the Scot who was able to take control of the match. 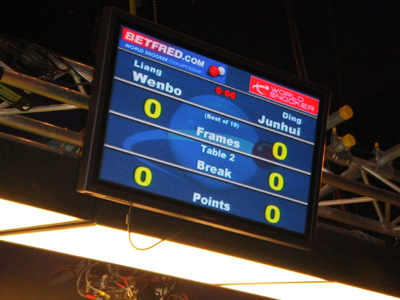 Hendry’s second round opponent would be Ding Junhui, who memorably for me came through an opening round with Liang Wenbo, that had Ding lost, he would have lost his place inside the top 16 and been overtaken in the rankings by his countryman. At one stage it was Liang who led 8-7 and looked to be on top having won four frames in a row, but from somewhere Ding was able to dig deep and produce breaks of 111, 91 and 63 to win what for me was one of the most significant matches of his career to date. Those matches aside, it was to be a relatively quiet opening round, a marathon three session match between Mark King and Rory McLeod being the other talking point, but the tournament was to catch fire in the following round. Most notably, defending champion Ronnie O’Sullivan was to exit the tournament at the hands of Mark Allen, while John Higgins came back from 12-10 down to win a thrilling match with Jamie Cope 13-12 on his way to what would be the title. 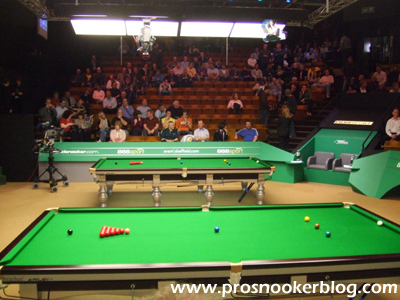 The final session was particularly memorable for the arena being extremely warm at the time, with two people passing out and requiring medical attention, the second right behind me as I remember having to get Eirian Williams’ attention as Higgins eyed up a do or die pot to the right-centre pocket. As he returned and made the pot, there was only going to be one outcome as he won the match with a break of 80. 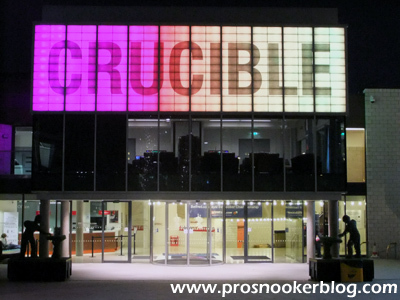 John was to be involved in another thrilling best of 25 frame match in the quarter-finals as he won the last two frames to defeat Mark Selby in one of the best matches that I can ever remember having seen at the Crucible. There was also to be a ninth career maximum break for Stephen Hendry at the last eight stage, the Scot at the time playing his best snooker at the Crucible for many years, but that break was to be the precursor to a five frame losing streak against Shaun Murphy, who eventually came through a 13-11 winner. The semi-finals were to prove interesting for the fact that both began with one player streaking ahead, before seeing the players behind roar back and make their matches far closer than they had at one stage looked like being. Despite those fight-backs from Mark Allen and Neil Robertson however, it was to be John Higgins and Shaun Murphy who would contest the final, with Higgins’ safety play in particular helping him to an 18-9 victory. 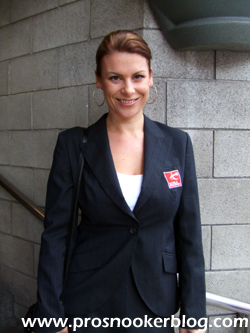 In fact I remember that the match was over so soon in the final session that there was to be a six reds exhibition involving Michael Holt and Ken Doherty afterwards, with six reds at the time being actively pursued by the governing body as a means of making the game more popular. Though Barry Hearn was barely months into his stint at the helm of World Snooker at the time, already his changes were being felt as for the first time players were introduced to the Crucible arena with accompanying music during their walk-ons, with Mark Allen’s opening round match against Tom Ford (incidentally the first match officiated by Leo Scullion at the venue), being my match for the opening morning of the event. Indeed it was a disrupted start to the tournament for some of the referees as I recall that those based in mainland Europe were unable to make it to the venue for the start of the tournament due to a volcanic ash cloud somewhere in between, necessitating Scullion’s début slightly earlier in the tournament than he had anticipated. 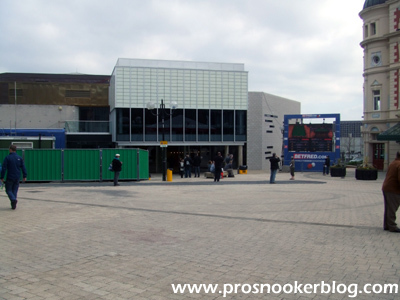 Again, the event was to be sponsored by Betfred, this time back with a red carpet in the arena and it was to be a tournament perhaps best remembered for the fairytale run of Steve Davis to the quarter-finals, including his sensational victory against defending champion John Higgins at the last 16 stage. Before that however, Steve had to come through a deciding frame against Mark King in the opening round, one of three deciders with Martin Gould and also Stephen Hendry also coming through by a single frame. For Hendry it was to be a comeback win against the little known (and little in stature) youngster Zhang Anda, while Gould recorded an excellent win against Marco Fu. For Martin there was to be better to come in the second round as he produced some explosive snooker to move 6-2 and then 11-5 up on Neil Robertson by the end of the second session, just two away from a place in the quarter-finals against Steve Davis as it would turn out. 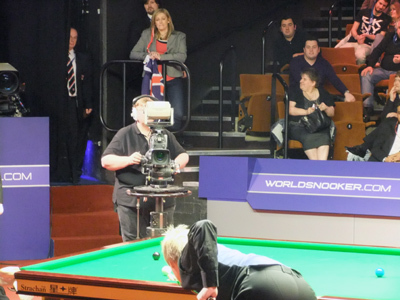 Of course however, we all know what would happen next and I had one of the best seats in the house down on the front row next to the players, for what would prove to be one of the most memorable sessions of snooker I have ever seen. You can read my blog written at the time here, but looking back now I most recall how Robertson kept it relatively tight and did not take too many risks, but was as clinical as he had to be to keep himself in the match. It is also of course impossible not to mention to moment when referee Olivier Marteel erroneously picked up the cue ball while Gould was at the table, which combined with a lengthy delay in replacing the white no doubt contributed to Martin missing his next shot. Although Gould was able to move to within a single frame of victory, it would be Robertson who would take the next three frames to clinch a famous victory, on his way to his maiden world title just nine days later, while Gould could only wonder what might have been. 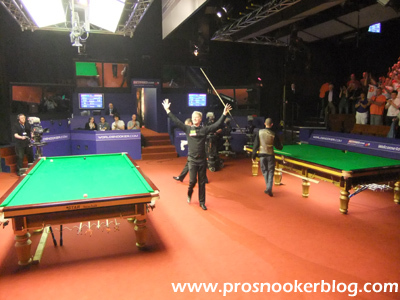 To his credit however, Gould stayed around the venue through until almost the end of the tournament, determined to take as many positives from his run as he could. Next up for Robertson was of course Steve Davis, who rolled back the years during the first session of his match with John Higgins in particular to take a 6-2 lead, eventually winning 13-11 to the delight of the Crucible crowd, both in the arena itself and outside between the building and the CueZone. There was a real buzz around the place that day that only comes around every so often and I will always remember walking back to the car park at the end of the day and seeing Steve sneak out of the fence at the side of the venue with nobody else around and just be able to say well done. He would prove to be no match for Neil in the next round, but he was able to give us another memory to treasure that week however as he played his part in the hilarious 25th year anniversary ‘re-match’ with Dennis Taylor, which is a must-watch on YouTube if you have not seen it before. 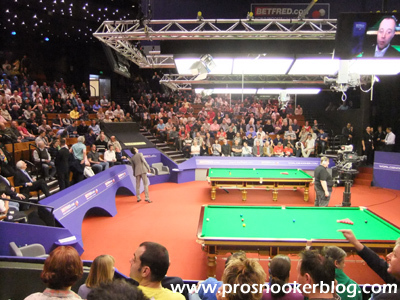 Another memory from that week was that it was the only time that I have ever been able to see a 146 break live, as Mark Allen and then later in the tournament Graeme Dott were able to achieve the feat, the applause from the crowd being close to that for a maximum itself. 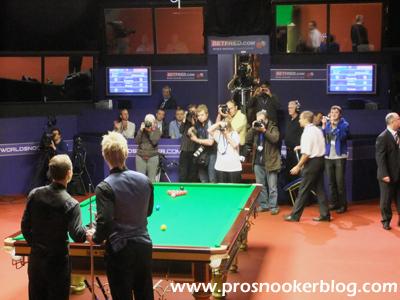 As for the semi-finals, Neil Robertson was to establish an early four frame advantage against Ali Carter and would never really look back, but the second between Mark Selby and Graeme Dott was to be a slow burn thriller, as Selby tried unsuccessfully to draw level, Dott eventually winning 17-14. Unfortunately, as memorable as the final session in particular was, even more so were the hours after the winning ball was potted, as I recall checking my phone whilst still inside the arena and seeing a text message informing me of the breaking story involving John Higgins and the now infamous video published on the News of the World website. From there a group of us retreated to the nearby Wetherspoon, watched the video and discussed the ramifications in some level of shock. 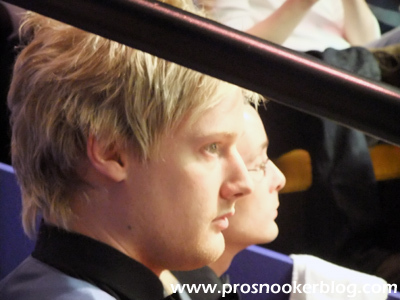 It was difficult not to let this overshadow the final, which proved to be a real marathon between Neil Robertson and Graeme Dott, but eventually it was the Australian who proved to have the staying power required and he won the last three frames to run out an 18-13 winner, watched on by his flag bearing mother from the player’s box. I recall being in the second row and at one point looking to my left and realising that Ray Reardon was sat next to me, while I also remember having a photo with and chatting to Barry Hearn in the arena shortly following the trophy presentation about how I hoped he would be able to save the sport.